A state budget event in Nome sponsored by a conservative group ended with an unexpected dialogue after a local tribal leader criticized Alaska Gov. Mike Dunleavy for limiting public testimony. Five budget roadshows funded by the Alaska chapter of Alaskans for Prosperity are described as public but ticketed. Prior events in Anchorage and Kenai drew protesters who were confined outside and audience comments that were tightly controlled. Wednesday’s event in Nome was preceded by the disorderly conduct arrest of 28-year-old protester Brenda Evak at the airport after Dunleavy landed just after noon. Nome’s district attorney said Thursday that no charges will be filed. Evak attended the budget event. The event at the historic Old St. Joseph’s Hall drew locals inside and student protesters who stood with signs outside. Unlike prior AFP events, no one took tickets at the door in Nome, participants said. Otherwise, it initially followed the same course: Dunleavy presented his 22-page PowerPoint on the budget and proposed constitutional amendments, and took questions from note cards rather than allowing audience members to speak. Then Melanie Bahnke, president and CEO of regional tribal consortium Kawerak, raised her hand instead of using a card. Bahnke almost didn’t attend the event, she said Thursday. She was concerned about requirements that participants register, which she didn’t, and that organizers would use her image without permission. But, she said, she felt as a leader she had an obligation to welcome Dunleavy and “give voice to people in our region” because the governor wasn’t hearing from all sides on his proposed budget. She raised her hand and left it up for what another audience member estimated was several minutes. Two AFP staffers approached her twice, Bahnke said. They kept trying to offer her note cards. She told them she’d already filled one out. Others at the meeting said someone in the crowd shouted that, as a tribal leader, Bahnke should be allowed to speak. Audience members began silently pointing at her. The third time someone came over, Bahnke said, she was told she’d be allowed to speak. Her comments, captured in a video by The Nome Nugget newspaper, continued for about seven minutes. They focused on the “disproportionate effects” to rural communities from Dunleavy’s proposed budget including cuts to public safety, education and social service programs such as a youth facility in Nome. Bahnke also criticized the process organizers used to conduct the event. “Our community is very diverse and we’re no stranger to having difficult conversations,” Bahnke said, describing Nome as a place that’s fairly evenly split between Alaska Native and non-Native people, in a region with half its population 18 and under. She invited Dunleavy to return to Nome for a “not exclusive” gathering paid for by Kawerak to discuss his budget’s effects in the region and criticized the practice of allowing the audience to address him only through note cards. Rep. Neal Foster, D-Nome, in an interview Thursday called Bahnke’s gesture “one of our great moments in local history. She demanded to be heard. She’s kind of our local Elizabeth Peratrovich right now." 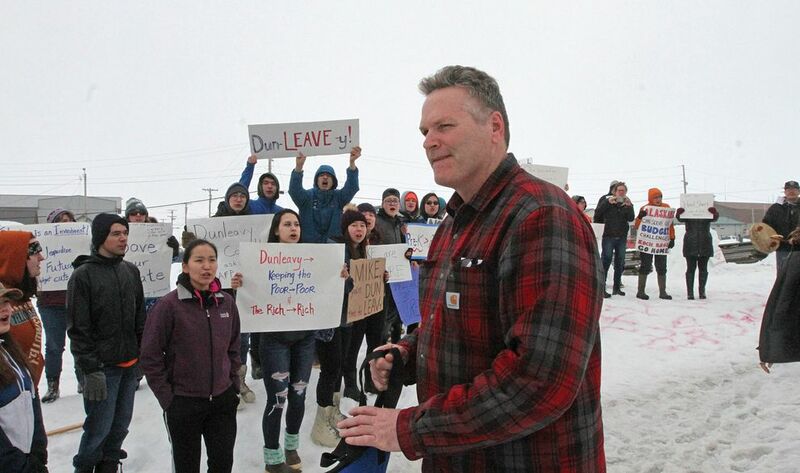 Dunleavy’s public Facebook page Thursday morning featured an upbeat short video about the trip to Nome that showed his arrival at the airport, meeting with local officials, and at the event. Dunleavy spent time on the Seward Peninsula as a teacher in Koyuk. He and his wife, Rose, who grew up in Noorvik, were married in Nome. Dunleavy spokesman Matt Shuckerow said the Nome AFP event wasn’t filled to capacity, so it was “opened up to folks on a day-of basis” at the door and participants got the chance to speak once all the note cards were read. “The governor took questions in an open format after the written questions were addressed,” Shuckerow said. A total of 15 people spoke, he said. The governor also toured the Nome port and met with local officials and media. Samuel Johns, standing in the back of the room near Evak during the AFP event, took Dunleavy to task for not greeting the young students outside the building and accused him of “acting like a king” given the way the event was originally structured. But local accountant Mark Johnson, a 30-year Nome resident and city councilor, attended the second half of the meeting and said the governor’s role in the dialogue was encouraging. 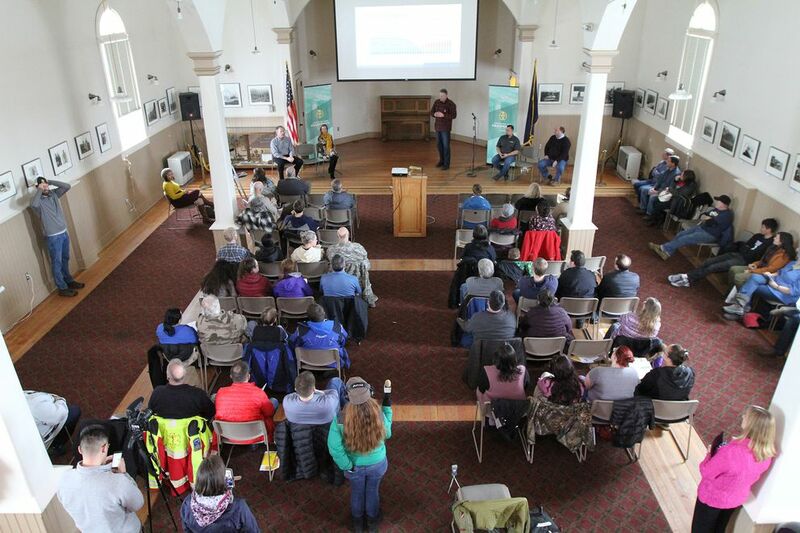 “The majority of people if not all people wanted an open session here in Nome and probably other rural places, and that’s how it was,” said Johnson, who also runs a local hunting and fishing store and serves as CEO of Unalakleet Native Corp.